An introduction to some of the many special collections owned by the School of Theology Library. A link to the website hosted by the BU School of Theology Library with the digitized motive Magazine. Learn more about the project and staff responsible for making the digitization project a reality. American artist Margaret Rigg (1928-2011) was the artist and art director of the Methodist magazine motive. She taught art at Eckerd College for 33 years and brought the art collection donated to School of Theology Library to other schools, churches to introduce and educate students about the intersection of art and theology. The STH Library is home to her personal papers and her artwork. Click here to explore our archival holdings. A project borne from a partnership between the BU School of Theology Library, Center for Global Christianity and Mission, and the General Board of Higher Education and Ministry (who owns the copyright for motive Magazine). motive Magazine (always spelled with a lowercase 'm') was the official magazine for the Methodist Student Movement and, for a time, the University Christian Movement (UCM). Much celebrated at time of publication for its avant garde editorial and artistic vision, in 1966 Time Magazine said it stood out among church publications like a "miniskirt at a church social." It was the single winner up to Life as Magazine of the Year in 1965. Ultimately, its strong stands on civil rights, Vietnam, and emerging gender issues became more than Methodist Church officials could take. They withdrew funding and it ceased publication in 1972. An entire generation of religious activists were shaped by its vision. A link to the History of Missiology website, a joint project between the School of Theology Library and Center for Global Christianity & Mission. This project is an example of the Library’s re-articulation of its pedagogical role. In a world of high speed networks, digital content, and massive search engines, the Theology Library is attempting to build focused collections of digital content in order to enhance teaching and learning. The site provides access primarily to classic writings in the history of Protestant mission thought. Written by cross-cultural missionaries, mission administrators, and mission promoters, the collection contains mission theology, theory, and practice as well as some of the first ethnographic studies of people in primal societies, and histories of encounters between westerners and people from Asia, Africa, and the Americas. The Theology Library and the Center for Global Christianity & Mission are aware that they are indebted to the peoples and nations in the global south for much of this body of literature. Digitizing these sources and providing global access through the Internet is, they hope, a way to return this information to those from whom it came. This site also provides biographical sketches and links to digitized material written by or about specific missionaries, missiologists, and mission administrators in the belief that mission theology, theory and strategy are best understood in their social context. The Theology Library and the Center for Global Christianity & Mission will continue to scan texts, collect other digital documents in the public domain, and make them available on this website. Special thanks are due to Gerald H. Anderson, editor of the Biographical Dictionary of Christian Missions, for allowing this site to use biographical sketches from the dictionary, the Overseas Ministries Study Center for scanning and making available their legacy articles, and to the Boston University School of Theology, the DeFreitas Family Foundation, the Kip Knight/Peggy Day Foundation, and the Boston University Instructional Technology Grant for financial support. 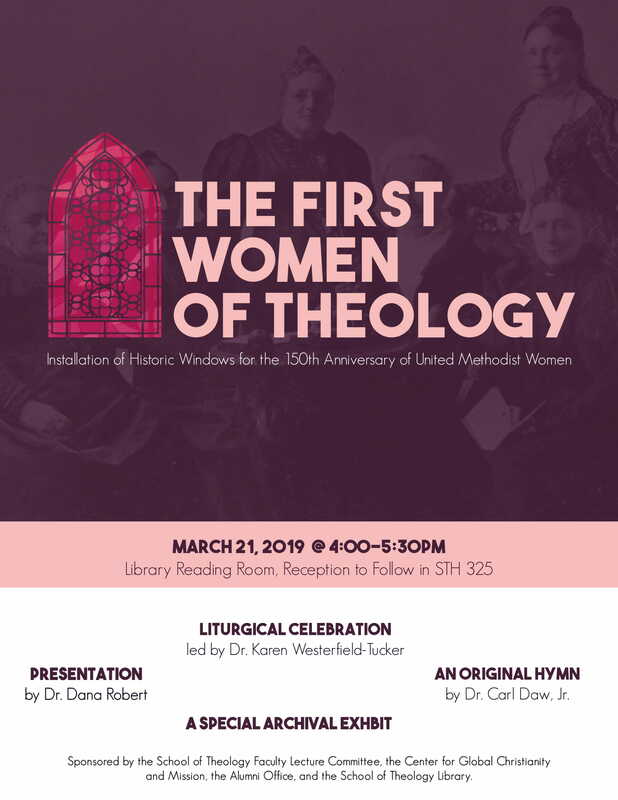 This online exhibition is paired with an in-library exhibition during the Spring 2019 semester, with special lecture by Dr. Dana Robert titled “The First Women of Theology: Installation of Historic Windows for the 150th Anniversary of United Methodist Women” on 21 March 2019. This exhibition intends to highlight the honored in the windows installed in the School of Theology Library, originally installed in the Tremont Street Methodist Episcopal Church. We celebrate the 150th Anniversary of the Woman’s Foreign Missionary Society (predecessor of the United Methodist Women), an organization which supported the work of women in foreign lands founded during a stormy night on 23 March 1869. 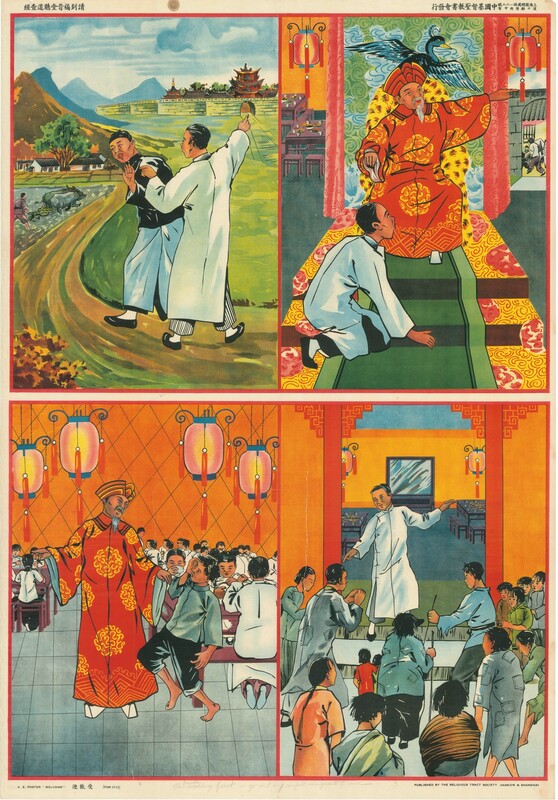 Included in the Chinese Christian Posters project (http://ccposters.com/) are images of posters housed in the School of Theology Archives, like this one to the left, titled "Welcome," showing Pictures from the Parable of the Wedding Banquet (Mt. 22). Click here to view the School of Theology Archives collection, a part of the Chinese Christian Posters project. Between 1927 and 1951 millions of Christian posters entered the Chinese market. Printed by the thousands onto the cheapest paper, most were used in street preaching and teaching. Others were hung in tearooms and shop windows, or put up with starch and brooms on city gates and local temples. The bright-colored posters briefly attracted attention before they tore, were covered by a more current notice, or dissolved in the rain. These visual messages competed aggressively for the soul of China. The Center for Global Christianity & Mission, funded by the Henry Luce Foundation, is pleased to make hundreds of these rare images digitally accessible and searchable for the first time. 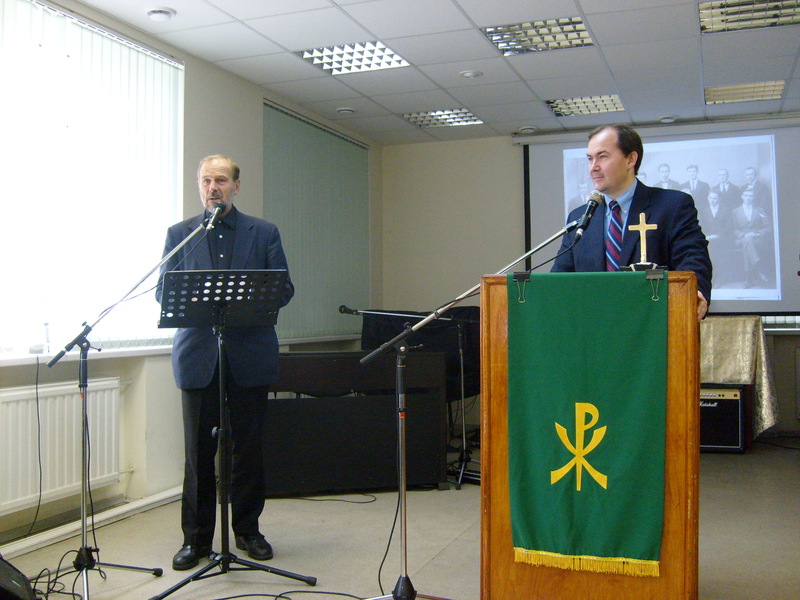 A link to the Russian Methodism website. Dana L. Robert, Truman Collins Professor of World Christianity and History of Mission, Boston University School of Theology, and Sergei V. Nikolaev, E. Stanley Jones Professor of Evangelism, Russia United Methodist Theological Seminary, announce the establishment of the Digital Archive of Russian Methodist History. The Center for Global Christianity and Mission of Boston University School of Theology and the Boston University School of Theology Library in partnership with the Russia United Methodist Theological Seminary are launching a digital collection on the history of Russian Methodism. The first entries in this archive are unique documents collected by Dr. Robert on the history of Russian Methodists in Harbin after the Russian Revolution of 1917. Other relevant materials are being identified for inclusion. The goal is to make these rare and priceless documents on the past of Russian Methodism available to scholars and seminary students and to provide present-day Russian Methodists and others with a more complete understanding of the history of Russian Methodism.